With winter's chill biting more and more every day, we're ready to curl up in front of a fireplace. 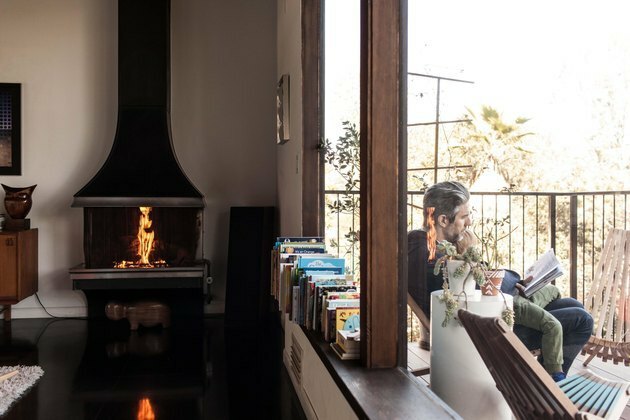 But if you're bored of your home's standard red brick and oak mantel fireplace, warming up in front of the flames may inspire a renovation. Scroll on for nine modern living room fireplace ideas that span the breadth of contemporary cool. Don't be afraid to paint your fireplace a bold hue like the traditional silhouette featured in this living room. The rich finish of the dark brown surround makes a lasting impression set against crisp white walls. We can't get enough of this blue-gray living room designed by Arent & Pyke. 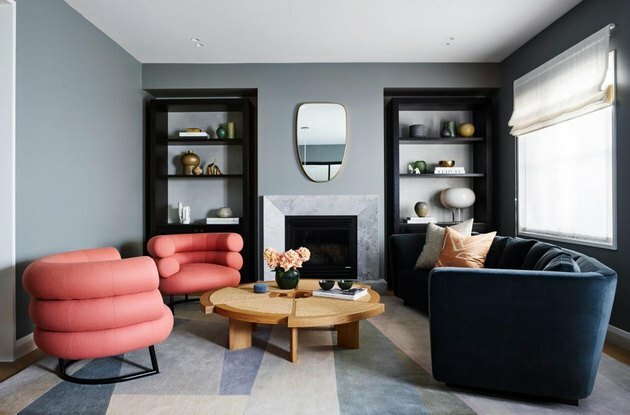 The on-trend curved furniture balances rectilinear elements — like the built-in bookcases and the marble fireplace surround — beautifully. Have curved walls? This take on a stone fireplace surround would be a drool-worthy addition to any living room. In this 1962 midcentury California home, the pale stonework feels like the perfect modern update — that doesn't forget the past. The team over at Croma Design really outdid themselves with this lofty living room featuring contemporary light fixtures, high-end furniture, and luxurious fabrics. But the pièce de résistance is really the hot-rolled-steel front of the floor-to-ceiling fireplace. We're pretty much obsessed. 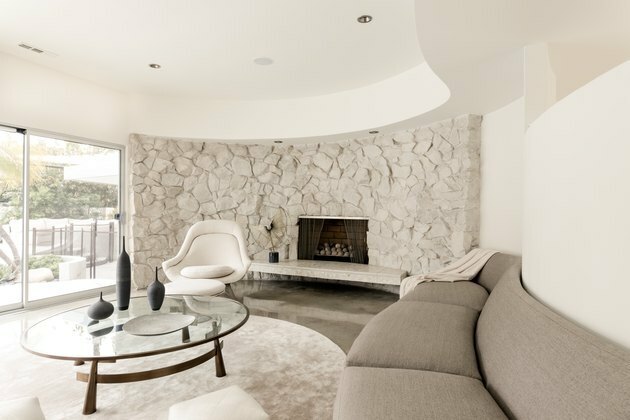 The dramatic angle of interior designer Carol Estes' concrete floor-to-ceiling fireplace easily takes center stage in her modern living room. 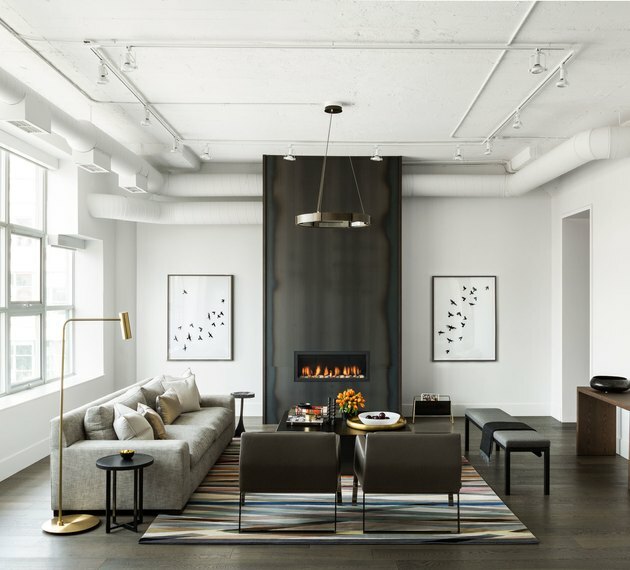 The suede-like matte finish of the surround paired with warm wood accents, leather lounge chairs, and layered area rugs inject loads of warmth and texture into the space. In this Carmel Valley, California home, a bold color palette of black and bright white demands attention. 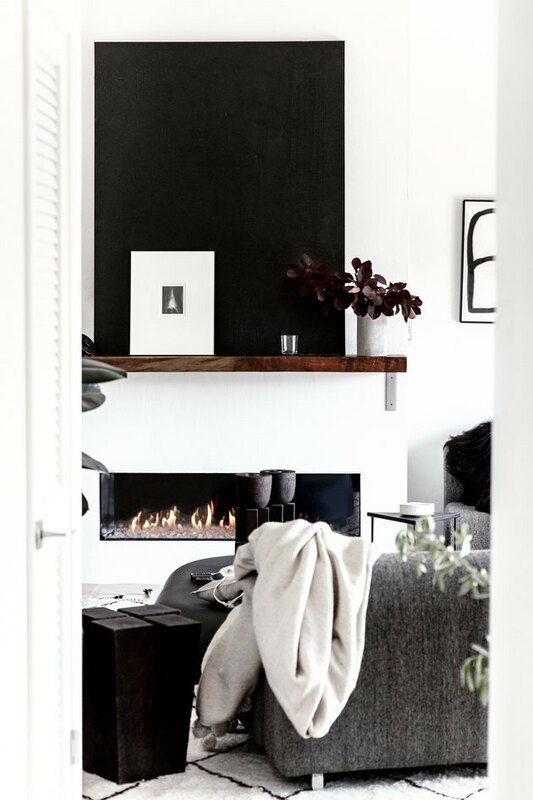 A rich wood mantel above a warm crackling fire prevents the space from feeling cold or uninviting. Give your living room a beach chic makeover by embracing a coastal bohemian aesthetic like Kim from The Minimal Animal did in this space. Pick a chunky wood mantel, play with texture, incorporate patterns, and integrate greenery throughout. 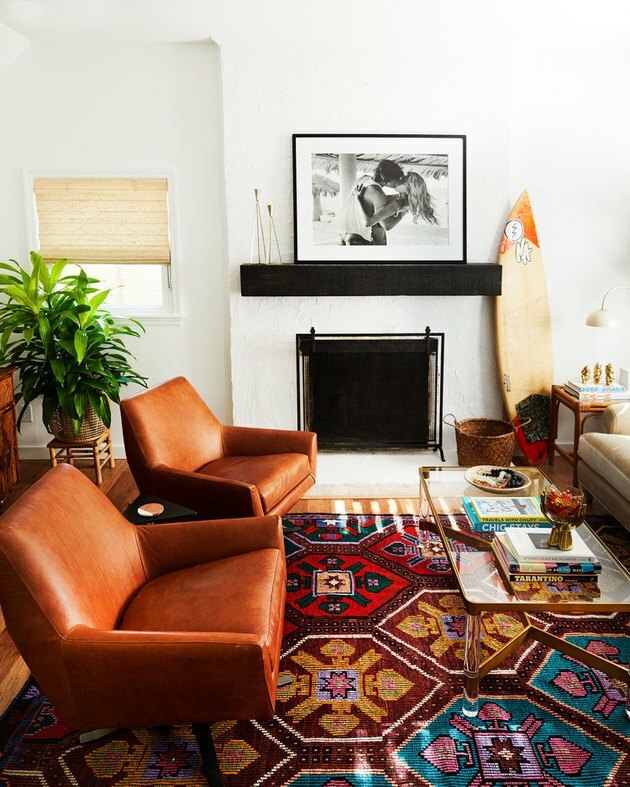 Top it all off by displaying your fave surfboard. 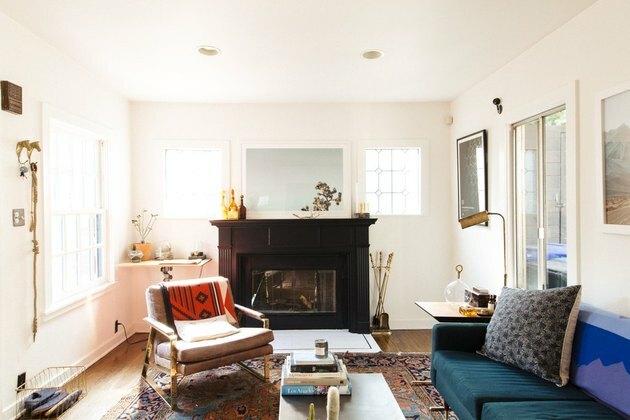 Not fond of bulky, room-dominating fireplaces? 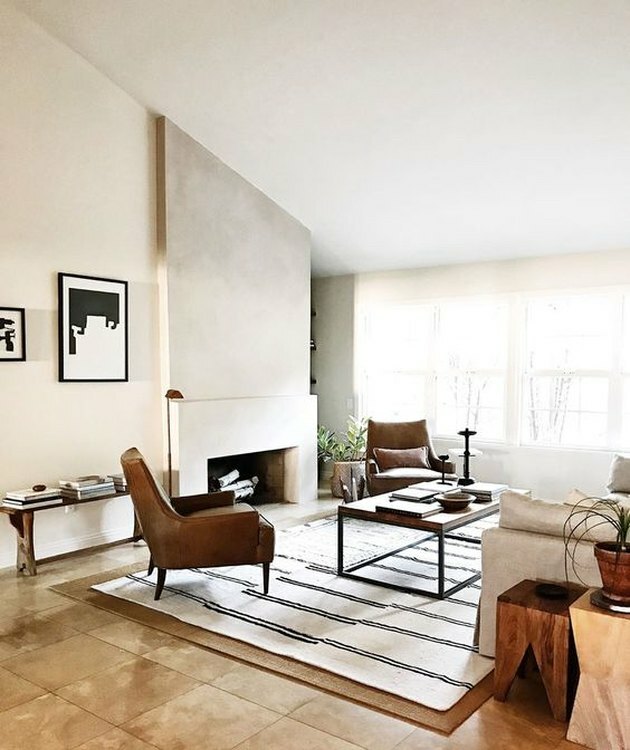 Perhaps you want something a little sleeker like the ultra-stylish, black freestanding gem in this rock star's home in the Eagle Rock neighborhood of Los Angeles. 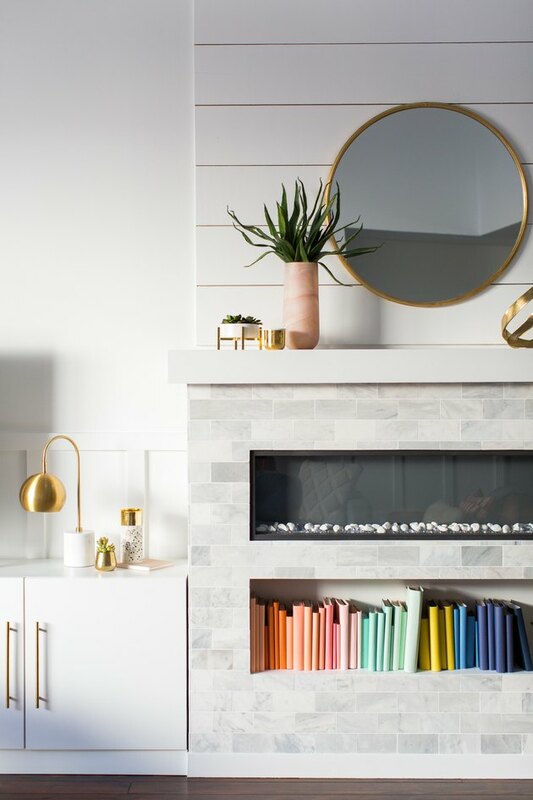 Blogger Ashley Rose from Sugar & Cloth added a niche for books below her electric fireplace to display their brightly-colored spines. She continued the colorful theme on the mantel, which is decorated with gold accents and hints of greenery.